In December of last year, there was a fire in the Sanctuary of our church. Luckily, the fire was detected quickly and extinguished, but it did cause some damage to one side of the church. The damage was limited enough that we can still use the building (not the Sanctuary), but construction started the Monday before Easter to repair the worship space. As with most church, our attendance increases on Easter, so the alternative spaces we've been using in the building weren't going to be large enough. 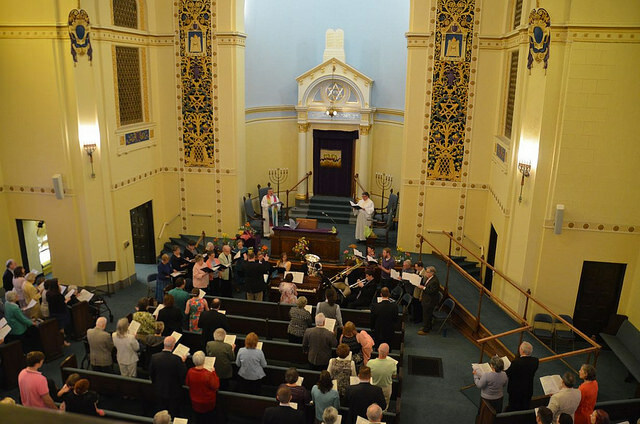 The decision was made to accept the offer from B'nai Sholom Synagogue to meet in their facility on Easter Sunday. This is hospitality, when a congregation of another faith, one that doesn't believe in the resurrection of Jesus, offers to house your worship celebration. It is radical, and it is what the God both congregations worship tells us we should do. This is evidence that "church" has nothing to do with the building. The "church" is wherever the people are gathered. I hope we learn that. I hope this is a door to greater community between us and the B'nai Sholom congregation. Over 80 years ago, our church had a fire that destroyed everything except the outer shell of the building. 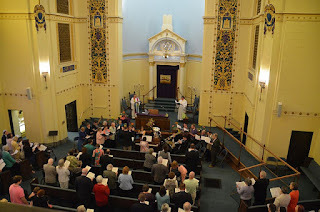 The congregation then met for 2 years at the Synagogue, so this Easter, there was a sense of home in a different place. The church is the people.